The following was written by Noam, an 11th grader at Ironi Hey High School in Haifa. Noam and his classmates recently visited Gann Academy as part of the Boston-Haifa Connection’s school-to-school partnerships. About a week ago, I was asked to sum up and tell you all about our delegation and the week we spent in Boston. I wondered what to focus on, what to write. When friends asked me how it was, I found it difficult to find a word or a sentence that would accurately sum up my and my 21 friends’ two-week stay in the U.S.
“Amazing.” “I want to go back.” “Pure madness.” “Awesome.” were some of the statuses that filled my Facebook the day we returned to Israel. Although I approve of all these words, I can’t say that one in particular reflects what it was like. The right term would probably be “Havaya“– a great experience–where we met and connected and made friends with people our age who live a 12-hour flight away from us. People with whom we have one major thing in common – we are all Jewish. The visit to the U.S. started with three extremely intensive days in Washington, DC, where we learned about the American vision, the ideals, values and politics of the American democracy and how the U.S. has acted in order to implement them. We then traveled to Gann Academy, where the hosting families were already waiting for us, opening their houses for our 7-day visit. At first we felt a little awkward, but I can tell you that very soon the ice was broken, when on the first day we started to talk, play basketball and some even participated in Simchat Torah at the local synagogues. In the next few days, the havaya I mentioned earlier was even greater. During the tours in Boston with our hosts, the meetings with the whole group in different houses and all the other activities we were exposed to, we learned interesting details about our hosts’ social lives, their routine and how Judaism is reflected in their everyday lives. We learned, for example, about the long distances between one town and another, which sometimes means a two-hour ride to school in the morning. Besides the differences, we found many things in common with our hosts, like movies, music, hobbies and so on. On Monday, all of us, the Israeli delegation together with the Bostonians, went to Camp Yavneh in New Hampshire, a camp where Jewish kids and teenagers meet and live together every summer. I can definitely say that staying over night at Camp Yavneh was a highlight of our week with Gann. If at the beginning we were two separate groups, the Israelis and the Americans, now four days later, we were one big group. Almost everything I have said so far can be true about a connection with a school that is not necessarily Jewish. So, what do we really have in common? That is something we found out at Camp Yavneh. It started right in the beginning, when we found out that there are areas in which we think about Israel and Judaism very differently from the Americans, but there are areas in which we think alike. 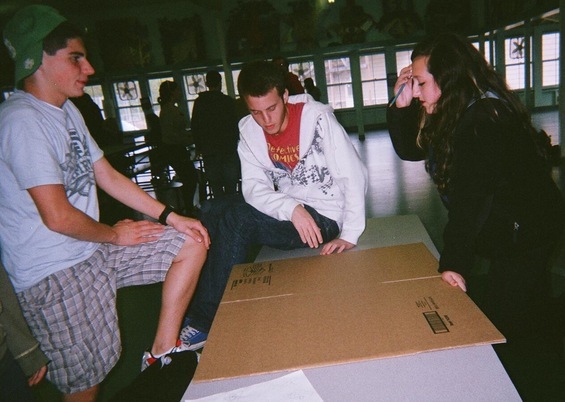 In another activity, we were divided into small mixed groups and had to create a Jewish communal space. Because the Boston students live as a minority within a non-Jewish population and we Israelis live in a society that is mostly Jewish, the job at hand involved discussions about the different opinions. Some of us thought we should show how the Jewish minority integrates with the majority. Others thought we should show how Jews who belong to different streams/denominations live side by side, how they connect. The members of the groups had to discuss the issues and create a work that will reflect the different perspectives – create the ultimate Jewish communal space. When the job was done, it was very interesting and even exciting to hear why each group chose the particular way. 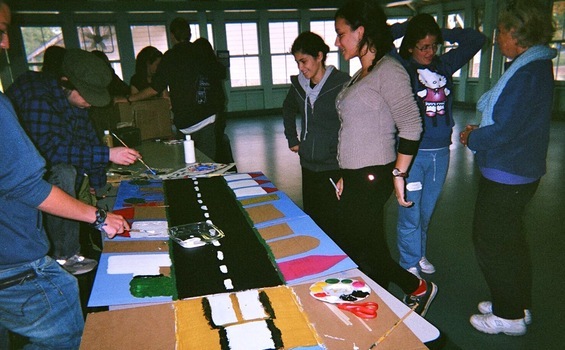 During our stay at Camp Yavneh, we were all able to connect much more and the connections that started just a few days before became much stronger. The day after camp, we went to Boston, visited the Vilna Shul (one group) and CJP (the other group) and walked through the Holocaust Memorial in downtown Boston. These tours gave us answers to many questions we had wondered about the day before at Camp Yavneh. The next day, Wednesday, was the last day in Boston, the day we went back home. We spent the morning at Gann, and at lunch the bus to N.Y was already waiting for us. Saying goodbye to the Boston kids was really hard. There were lots of last minute talks and hugs. Some people even shed tears. We hung out for a couple of hours in Times Square, which was awesome and then got on the flight home to Israel. So, to sum it all up with one word, it was a Havaya (in English it would have to be three words- a great experience).